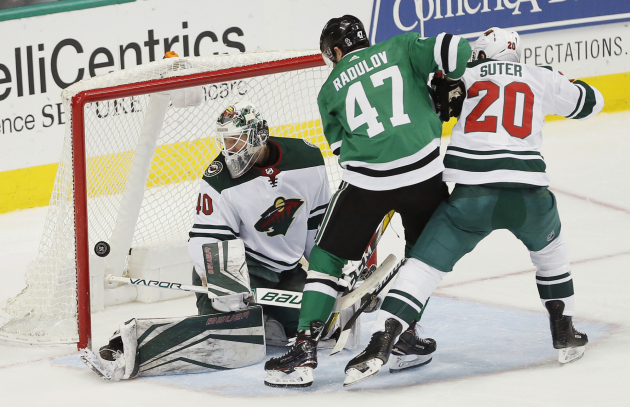 At one point, the Stars occupied the third seed in the Central Division that the Wild has had a hold on for weeks. Now, though, Dallas is on the brink of being unable to catch the Wild, as a loss by the Stars Thursday at Xcel Energy Center would put its division rival out of reach. The Wild will try to hold off the Stars with a different lineup, as Gustav Olofsson will draw in for Nick Seeler – a decision Boudreau made to keep Olofsson involved, as he’d been a healthy scratch for the previous four games. This is the first of two in a row against the Stars, as the season series between these teams will wrap up Saturday in Dallas. The Wild has collected at least a point in six straight, going 3-0-3, and during that run, the team has given up more than two goals a game just once. 3-0-3: The Wild’s record in its last six games. 58: Points on home ice for the Wild, tied for second-most in the NHL. 4: Game point streak for winger Zach Parise. 5: Points in two games against the Wild for Stars center Tyler Seguin. 1: Win for Dallas in its last nine games. Dallas has fallen back of the playoff pace in the Western Conference, sitting five points back of the second wild-card berth. A recent eight-game losing streak contributed to that slide; the Stars snapped out of that funk Tuesday with a 3-2 overtime win over the Flyers. With goalie Ben Bishop sidelined with a knee injury, Kari Lehtonen has taken over the Stars’ crease. He’s 13-13-3 with a 2.54 goals-against average and .912 save percentage. Seguin leads the team offensively with 39 goals and 73 points.